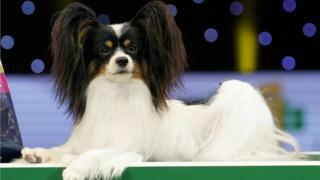 Belgian papillon Dylan may have taken the Crufts crown, but the judges were spoiled for choice as 27,000 dogs descended on the NEC over four days. Here are the facts and figures about the world's biggest dog show. The Birmingham exhibition venue is accustomed to hosting hordes of human visitors, but with their four-legged friends in tow that was more dogs than there are households in the neighbouring postcode district. Out of almost 21,000 competing dogs (the rest were just visiting) 3,611 were from overseas. Among the 44 other countries represented at Crufts, Italy led the way for foreign entries with 413, followed by France (389), the Netherlands (327) and Germany (325). The number of overseas dogs fell very slightly for the first time in almost a decade. Organiser The Kennel Club said it was a "potential sign of concern" for dog owners travelling after Brexit. The decrease was 0.3%, from 3,623 to 3,611 in one year. There were three breeds competing for the first time: the black and tan coonhound, the Russian toy and the white Swiss shepherd dog. Retrievers, golden and Labrador, made up more than 1,000 of the competing dogs at Crufts. Cocker spaniels have won Best in Show more than any other breed, with seven taking the trophy home in previous years. Irish setters, standard poodles and Welsh terriers have also won four times each. Video Crufts: How will the dog show be affected by Brexit?